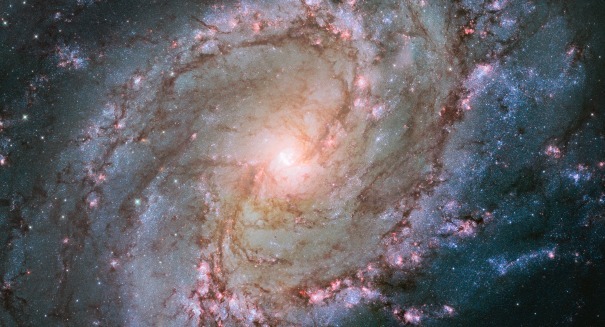 Scientists have recently discovered a galaxy farther away than any has ever been seen before. In a press release issued from Caltech, the scientists say that the discovery may upset current popular theories about the age of the universe and how it evolved. EGS8p7 was discovered when astronomers interlinked several telescopes. The image received of a far off galaxy is faint. Nonetheless, scientists were able to calculate that it is more than 13.2 billion years old. The universe is considered to be 13.8 billion years old. The cause for alarm stems from the type of radiation emanating from EGS8p7. The radiation includes Lyman-alpha lines which, theoretically, should not exist. This sort of radiation was supposed to have been totally absorbed in the early days of the universe by clouds of neutral hydrogen. This discovery means that cosmologists will have to reevaluate their theories on the evolution of the universe. The Lyman-alpha radiation should have been ionized early on. After the Big Bang, free electrons scattered across space, making it possible for light to travel. Over the course of about 500 million years, as the universe cooled, those electrons converged with protons to form neutral hydrogen gas that would have ionized the gas that allowed radiation to travel. What this new discovery means is that the universe did not ionize uniformly. “We are currently calculating more thoroughly the exact chances of finding this galaxy and seeing this emission from it, and to understand whether we need to revise the timeline of the reionization, which is one of the major key questions to answer in our understanding of the evolution of the universe,” Zitrin says.